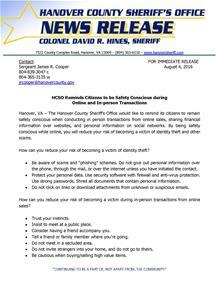 Hanover, VA – The Hanover County Sheriff’s Office would like to remind its citizens to remain safety conscious when conducting in person transactions from online sales, sharing financial information over websites, and personal information on social networks. By being safety conscious while online, you will reduce your risk of becoming a victim of identity theft and other scams. How can you reduce your risk of becoming a victim of identity theft? - Be aware of scams and “phishing” schemes. Do not give out personal information over the phone, through the mail, or over the internet unless you have initiated the contact. - Protect your personal data. Use security software with firewall and anti-virus protection. Use strong passwords. Shred all documents that contain personal information. - Do not click on links or download attachments from unknown or suspicious emails. How can you reduce your risk of becoming a victim during in-person transactions from online sales? - Insist to meet at a public place. - Consider having a friend accompany you. - Tell a friend or family member where you’re going. - Do not meet in a secluded area. - Do not invite strangers into your home, and do not go to theirs. - Be cautious when buying/selling high value items. - Perform the transaction during daylight hours. - If it sounds too good to be true, it normally is. - Take your cellphone with you. We encourage everyone to also follow these tips if they plan to meet someone they have met on a social network. The Hanover County Sheriff’s Office is open to the public Monday through Friday, 8:00 a.m. to 5:00 p.m. The Sheriff’s Office is located at 7522 County Complex Road, Hanover, VA 23069. Citizens are welcome to use our location as a safe spot for sales and exchanges. For further information on how to protect yourself online and during these transactions please visit http://www.craigslist.org/about/safety or http://www.hanoversheriff.com/31/Education-Events.